Like many before her, Anne Wanda Tessier made the sensible decision to obtain a Business Degree from the University of Ottawa rather than try to make a living as an artist. But her love of art and painting stayed with her, inspiring her to continue painting. 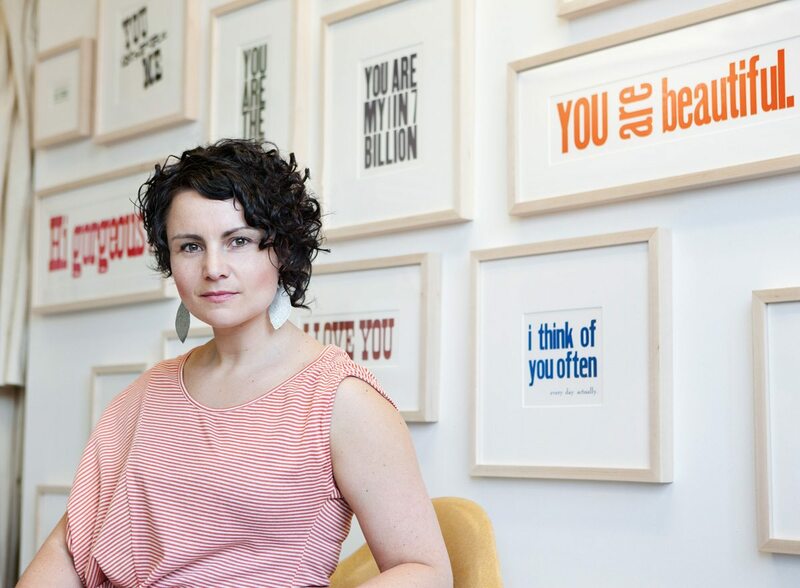 Her brightly coloured acrylic paintings have been exhibited in galleries in Ontario, Quebec, and Alberta, and now her interest in letterpress printing has resulted in a series of prints on display this summer (her show opens June 7 at Pressed cafe). The limited edition prints are graphic representations of compliments Anne has collected over the years in a small notebook. Reading them made her happy, and she wanted to share that happiness with others. Ottawa Magazine art director Jane Corbett talked to Anne recently about the genesis of her project and the process involved in the making of the prints. Marked and well-used wooden type blocks spell out Anne's initials. (Photography by Anouk Landry) Anne poses with her Compliments prints. (Photography by Rémi Thériault) A compliment inked and ready to print. Q. How did you become interested in letterpress printing? I’ve been interested in anything print-related for the past few years. I’ve always wanted to experience how typesetting was done before the days of InDesign and Illustrator, and I wanted to learn how to make those beautiful deep imprints on paper. In October 2010, I went to Printopolis, an international symposium on printmaking in Toronto. Printopolis was an eye opening look at the trends in printmaking, the studios that were available, and the projects printmakers were producing—it was inspiring to attend! That spurred me on to take a 1-week intensive letterpress workshop at the San Francisco Center for the Book in November, 2010. There I learned how to set type and operate a Vandercook press. Q. Tell me about the process of making a print. How long does it take? When I arrive at a print studio, I look through the type that is available and then choose a compliment that suits the font. There are a limited number of fonts to work with, and sometimes letters are missing or damaged. Some of the old lead and wooden letters need to be cleaned of many years of dried ink. Then the letters are placed backwards, by hand, one at a time, to form the words. A frame is put around the letters to hold them in place, and the spaces between the letters and the frame are filled in with pieces of wood and lead called furniture. Everything has to be tightly locked into position. Then the ink is mixed by hand to get the colour you want and applied to the press. Setting up the type takes about 2 hours, and the actual printing takes about 20 minutes for 20 prints. Then the cleanup! I call this “slow printing” and like slow food, it is a labour of love. Q. Which print was the first of the series? The first one was “You are beautiful” and the second was my favourite, “I think of you often — every day actually” (a personal compliment paid to me!). These two were printed at the Cumberland Museum in Ottawa on an antique Chandler & Rice pilot press made in the early 1900s. Q. Many of the works were printed outside of Canada. Do you plan your vacations around printmaking? Well, in a way yes! I decided to combine my love of art, printing and travel by choosing destinations where I would be able to rent press time and do some printing. I sourced locations at a website called Briar Press, which has information on all things letterpress. I took the paper with me in my luggage. I use papers with a high content of cotton to withstand embossing without tearing in the printing process, and this is not always easy to find in a foreign country. So far I have made prints in Brooklyn, San Francisco, Florence, and Montreal, and I’d love to print in Austin (Texas), Berlin, and London, just to name a few. Q. Would you like to have your own press? Yes, but they are expensive and if they break, they are almost impossible to repair. Plus I would need a larger studio to keep it in, so for now I will continue to rent press time. Q. Are you planning to continue the Compliments series? I have more in my notebook, and would like to continue. They make me happy, and I hope when other people read them, they will be happy, too. Anne Wanda Tessier’s series of letterpressed compliments will be on display from June 7 until July 31 at Pressed, 750 Gladstone Avenue. For more information visit www.annewanda.ca.